The scrap metal market remains relatively even in March after the strong start to the year we saw in February. After the biggest increase in a one month period in a full year prices fell slightly. The national average for crushed autobodies dropped just a couple of dollars, down 1.5%. However, compared to the same period in 2017, the national average remains 10.8% higher. Historically, in March we have seen an average increase in the scrap metal market by almost 3% over February. This marks the first drop in value during March for the Crushed Autobody Index since 2012. Across the country, there were no regional zones that outperformed (or in the case of 4/5 zones) under-performed greatly. Zone specific average prices ranged from a nearly 3% drop in Zone 5 (southeast) to an almost 1% increase in Zone 1 (west coast). Overall, none of the zones had more than a difference of a couple dollars from the previous month. The steel and aluminum tariffs that were in discussion during February were formalized on March 8th. The tariffs enacted are a 25% tariff on steel imports and a 10% tariff on aluminum imports. There are countries excluded from these tariffs, including NAFTA members Canada and Mexico. In addition, Australia was later announced as being excluded as well. Further exclusions will be taken into consideration on a case by case basis. The steel and aluminum tariffs will go into effect tomorrow, March 23rd. For some more detailed information on the import tariffs check out our latest post, “Steel and Aluminum Tariffs Formalized.” Included is information on where the U.S. gets its steel, global outlook and the affect of tariffs on automakers and consumers of the metals. It will be interesting to see if the 10% aluminum tariff has a significant effect on the recent highs of the market. 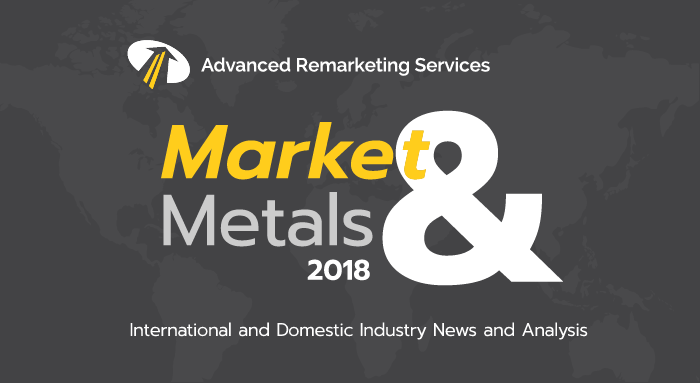 Since the low point of the last 5 years near the end of 2015 and beginning of 2016 the aluminum market has steadily increased to a five year high point at the start of 2018. From that low point, the average price per ton of aluminum has risen nearly 50%. After the announcement of tariffs it was possible there would be a rapid reaction from the scrap metal market. While prices are already at a recent high, the ferrous scrap market has been relatively quiet. Buyers and sellers have been taking some time to digest the news and holding out to see how things shake out. Since the tariffs go into effect tomorrow the next update posted could contain much more news!